Iron deficiency anemia is anemia secondary to inadequate iron supplementation or excessive blood loss. 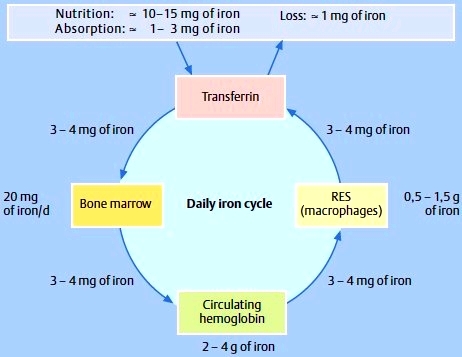 The daily iron cycle is depicted in Fig. 3.2. The human body contains 3-6 g (35-50 mg/kg) of iron. Two-thirds of this amount (2-4 g), circulate bound to hemoglobin. One-third (0.5-1.5 g) is stored as ferritin and hemosiderin in the reticuloendothelial system (RES) in the spleen, the bone marrow, and the liver. The liver also stores iron in hepatocytes. 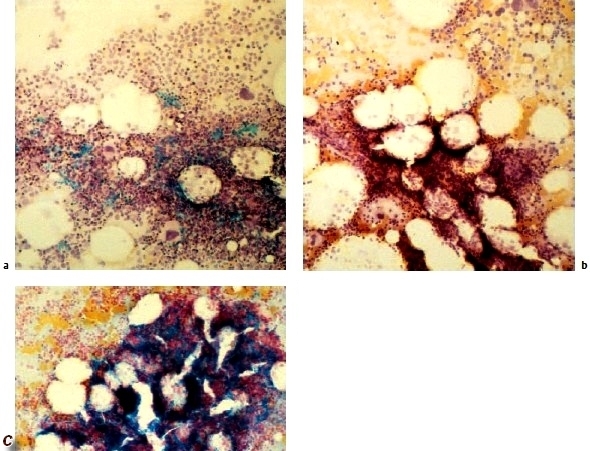 Hemosiderin can be detected by Prussian-blue stain. About 120-150 mg of iron are located in myoglobin. Although vital to many other tissues (e. g., respiratory chain), the iron in other locations comprises only a few milligrams. Iron reaching the plasma, after acquisition from food or released from stores in macrophages, is bound to transferrin. The transferrin concentration in plasma correlates with the total iron binding capacity (TIBC = serum iron plus unsaturated iron binding capacity). It can also be measured directly by immunologic methods in mg/dL. Normally one-third of the TIBC is saturated. Three to four milligrams of iron circulate in plasma. The bone marrow synthesizes about 6 g of hemoglobin daily, which requires about 20 mg of iron. After the breakdown of hemoglobin, transferrin transports the free iron to the RES, where it is stored by macrophages, until it is required again for the synthesis of hemoglobin. Only minute amounts of iron are absorbed from the plasma by nonerythropoietic cells. Daily iron requirement amounts to about 1 mg, and 1-3 mg in menstruating women. The daily loss of iron (skin and intestine) is about 1 mg. A normal diet contains 10-15 mg of iron on average daily. Only 10-20% of this amount is absorbed in the duodenum and jejunum. * any combination of these factors. * It is increased by: ferrous iron Fe2+, inorganic iron, acids (HCl), vitamin C, iron deficiency, increased erythropoiesis, pregnancy, and primary hemochromatosis. * It is decreased by: ferric iron Fe3+, organic iron, alkaline pH (antacids), precipitating substances, iron overload, decreased erythropoiesis, infections, and chelating substances (desferoxamine, deferiprone). • Dietary iron deficiency occurs often in infants as a result of unsupplemented milk diets. It is also commonly seen in women during their reproductive years, as a result of heavy menstrual periods, and during pregnancy (increased demand). • Iron deficiency is the most common nutritional deficiency worldwide. • The prevalence of iron deficiency is greatest among toddlers aged 1-2 years (7%) and adolescents and adult families aged 12-49 years (9%-16%). * bristly hair and brittle fingernails. * Most patients have a normal examination. * Skin pallor and conjunctival pallor may be present. Fig. 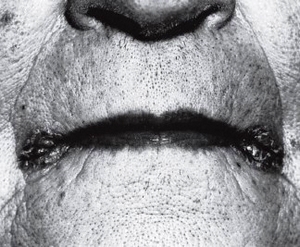 3.5 Atrophic tongue in iron deficiency anemia. Fig. 3.6 Cheilosis in iron deficiency. By far the most common cause of iron deficiency is chronic blood loss, for which the most frequently encountered reasons are hypermenorrhea and occult gastrointestinal bleeding. Iron deficiency should be suspected with excessive blood loss during menstruation. For example, if the blood flow can not be controlled with tampons alone, more than 12 pads per menstruation, or four pads per day are used, clots larger than 2 cm are observed or persist beyond the first day, or the period lasts for more than seven days. In case of iron deficiency without any evident source of bleeding, an endoscopic investigation of the gastrointestinal tract in search of malignancy is indicated. This is also true for premenopausal women, if hypermenorrhea is not clearly present. Other possibilities of chronic blood loss are repetitive epistaxis, blood loss with intravenous drug abuse, especially if intra-arterial injections are also performed, frequent blood donations, hematuria, e. g., with carcinoma of the bladder, hemoglobinuria, and rarely, factitious anemia. Iron deficiency in patients on dialysis results from blood loss associated with the dialysis process, frequent diagnostic phlebotomies, and disturbed platelet function due to uremia, with consecutive small bleedings. Also aluminum hydroxide, which is used to control hyperphosphatemia, leads to malabsorption of iron. Dietetic iron deficiency is seen in vegetarians, because meat is not only rich in iron but, in addition, it also enhances iron absorption in the gut. Gastric acid also enhances iron absorption. Achlorhydria in chronic atrophic gastritis, after gastrectomy, or vagotomy leads to malabsorption. Antacid drugs usually do not induce iron deficiency. Iron absorption takes place mainly in the jejunum. Therefore, it is diminished after bypass operations e. g., Billroth II or Y-Roux. Gluten-sensitive enteropathy and tropical sprue can induce iron deficiency. The increased iron requirement during pregnancy, lactation, and growth can all induce or aggravate iron deficiency. Tab. 3.3 summarizes the causes of iron deficiency anemia. 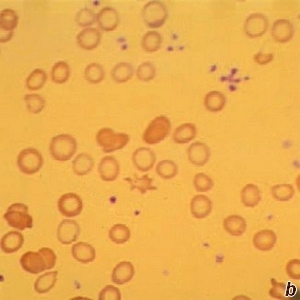 Erythrocytes in a blood smear are small and contain very little hemoglobin, so-called anulocytes (Fig. 3.1b). Iron is stored in the high molecular weight complex ferritin, in macrophages, and in the liver. An iron deficiency anemia only results when all iron stores are exhausted. Therefore, the serum ferritin level, which shows a particularly close quantitative correlation with whole body ferritin and whole body iron levels, is by far the most important parameter in the diagnosis of iron deficiency anemia. 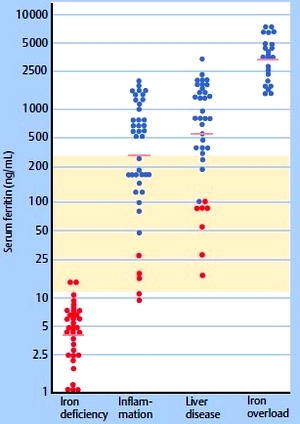 Serum ferritin values below the normal range are absolutely specific for iron deficiency. Values at the lower end of the normal range do not exclude iron deficiency, because inflammation, liver damage, and hemolysis can cause increased liberation of ferritin (Fig. 3.3). Therefore, every determination of serum ferritin must be accompanied by a measurement of C-reactive protein (CRP). If hypochromia and microcytosis are present, in spite of normal serum ferritin and CRP levels, then transaminases and reticulocyte levels must be determined. Still, in most instances including inflammation, a serum ferritin value > 100 ng/mL excludes iron deficiency. If the aforementioned conditions with spuriously elevated ferritin are considered, then the measurement of serum iron and transferrin levels is unnecessary, as these parameters are also influenced by the same confounding factors. For the rare cases that still remain unclear, the determination of iron in the bone marrow by Prussian-blue staining remains the “gold standard” for the assessment of iron stores (Fig. 3.4). As mentioned above, the proportion of hypochromic and microcytic erythrocytes (in percent) is significantly more sensitive for the diagnosis of hypochromasia and microcytosis than MCH and MCV. Typically in iron deficiency, the fraction of hypochromic erythrocytes is higher than that of microcytes. In contrast, the ratio is reversedin disturbances of globin synthesis of the thalassemia type. The number of reticulocytes is decreased or normal, but always insufficient for the degree of anemia. • Laboratory results vary with the stage of deficiency. • Absent iron marrow stores and decreased serum ferritin are the initial abnormalities. • Decreased serum iron and increased TIBC are the next abnormalities. • Hypochromic microcytic anemia is present with significant iron deficiency. elevated TIBC, and low serum iron. represents a relatively inexpensive and fast way to detect iron deficiency. Fig. 3.1 b Hypochromic anemia in iron deficiency with anulocytes. Fig. 3.3 Values for serum ferritin in uncomplicated iron deficiency anemia, inflammation, liver disease, and iron overload. Horizontal line: mean for each group. Red circles, patients with iron deficiency; blue circles, patients without iron deficiency. The normal range is shaded. Patients should be instructed to consume foods containing large amounts of iron, such as liver, red meat, and legumes. • Treatment consists of ferrous sulfate 325 mg PO qd-tid for at least 6 mo. Calcium supplements can decrease iron absorption; therefore, these two medications should be staggered. • Parenteral iron therapy is reserved for patients with poor tolerance, noncompliance with oral preparations, or malabsorption. • Transfusion of packed RBCs is indicated in patients with severe symptomatic anemia (e.g., angina) or life-threatening anemia. Patients should be instructed to continue their iron supplements for at least 6 mo or longer to correct depleted body iron stores. Most patients respond rapidly to iron supplementation with improvement in CBC and general well-being. GI side effects from oral iron therapy are common and may require decreased dose to once daily. Fig. 3.4 Prussian-blue stain of a bone-marrow smear. 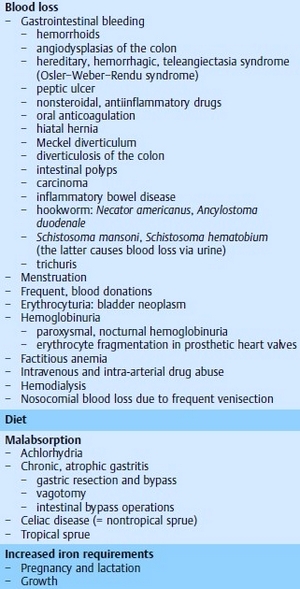 b Absent interstitial iron (iron deficiency anemia). c Increased interstitial iron (sideroblastic anemia and posttransfusional hemosiderosis).